AHS at the 2018 Reagan National Defense Forum! Through one of our most valued partnerships, AHS sponsored our fifth student delegation to the Reagan National Defense Forum (RNDF). Held at the Ronald Reagan Presidential Library in Simi Valley, California, RNDF is the nation’s premier defense policy conference. 15 AHS student leaders from 15 universities participated. RNDF assembles lawmakers, defense officials, soldiers, scholars, and journalists for a day-long discussion on the urgent and enduring questions of national security. Among this year’s distinguished speakers were Defense Secretary James Mattis, former Defense Secretary Leon Panetta and former National Security Adviser H.R. McMaster. RNDF is an unparalleled opportunity for our students to interact with defense policy leaders and understand the shaping forces of national security. We are thankful to the Reagan Institute for inviting our students to this exclusive gathering. The student delegates attended expert panel discussions ranging from the defense industrial base to the role of alliances in the age of great power competition. Listening to thoughtful and open deliberations on such complex dilemmas as deterring Chinese maritime aggrandizement and restricting nuclear proliferation, the students left the conference with broadened awareness of American security strategy. In preparation, the students participated in a seminar with National Defense Strategy Commission member Dr. Thomas Mahnken and his colleague at the Center for Strategic and Budgetary Assessment, Dr. Evan Montgomery. 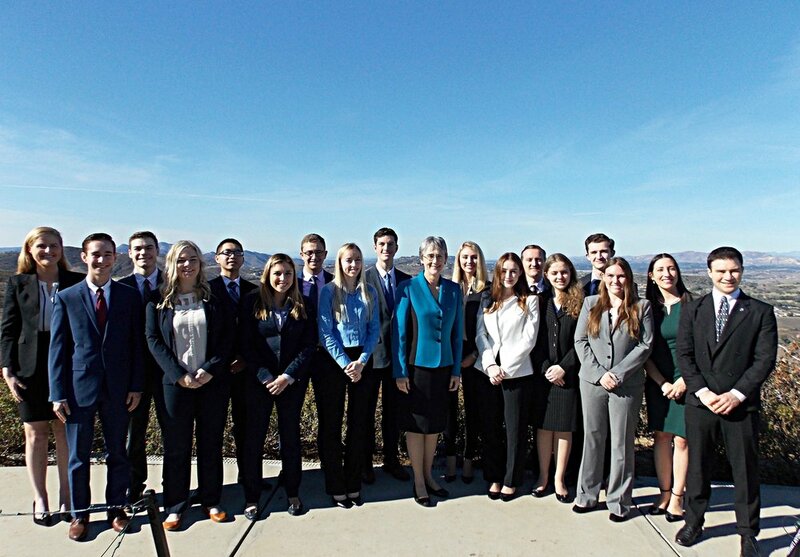 National defense leaders held personal conversations with our students, including Air Force Secretary Heather Wilson, Anduril Industries co-founders Trae Stephens and Palmer Luckey, Lieutenant General H.R. McMaster, and former Ambassador to Austria Susan McCaw. Candidly outlining the ambitions and talents which brought them success in public service, these accomplished figures provided our students with uncommon support in establishing their own career goals. Finally, the students were treated to an impromptu discussion with Karl Rove, Deputy Chief of Staff to President George W. Bush. RNDF brings together leaders and key stakeholders in the defense community - including members of Congress, civilian officials and military leaders from the Defense Department, industry, and administration officials - to address the health of our national defense and stimulate discussions that promote policies to strengthen the U.S. military. In an era of economic uncertainty where the threats to our national security are increasing in number and complexity, RNDF allows senior leaders from the defense community to come together with viewpoints on how best to deal with these challenges. Though President Reagan left office many years ago, the United States military continues to benefit from his commitment and vision for a strong defense. Recognizing that today’s decisions will affect our military capabilities for years to come, RNDF charges leaders from current and past Administrations and Congress to look beyond the immediate issues facing our armed forces and explore how we can build peace through strength for the future. Book Talk with Dr. Robert Kagan!